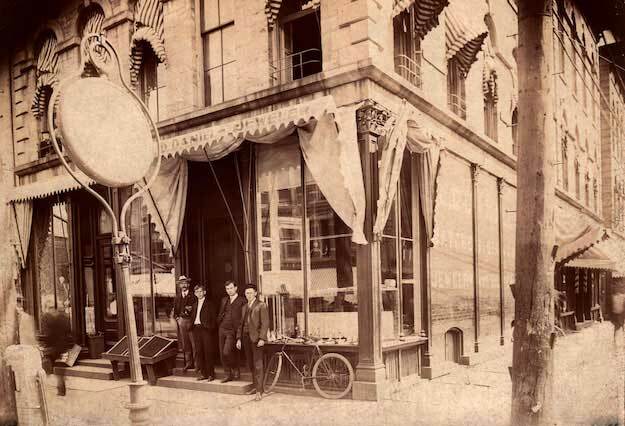 ALBION – This stunning photograph shows the storefront of John DeValson Daniels, a local jeweler who operated his business out of the old Empire Block at the intersection of North Main and East Bank Streets. Daniels, standing to the left and wearing a hat, ran this successful commercial venture for nearly fifty years when he finally retired from the profession in 1935. It is clear that Daniels was fond of leisure activities, including cycling, as he assisted in the formation of the Albion Cycle Club in 1895 and was appointed as a sidepath commissioner charged with overseeing the construction of bicycle paths in areas west and northwest of the village. Advertisements regularly appeared in the local papers, announcing Daniels’ inventory of bikes available for purchase in his store. He also served as president of Albion’s Sportsman’s Club as he was an avid hunter. In addition to his deep-rooted connection to the community through his successful business, John Daniels was a charter member of Albion’s Rotary Club, the Masons Damascus Temple, and the Pullman Memorial Universalist Church. He was often credited with owning the first automobile in Albion, a steam-powered machine called “The Rochester Steamer.” This automobile was likely a product of the Rochester Carriage Motor Company, operating for two years between 1901 and 1902, selling vehicles from $450 to $700. Around the time this photograph was taken, circa 1904, the store suffered a small loss of inventory. In the spring of that year, Daniels noticed a missing diamond ring valued at $100 (approx. $2,700 today) that was no longer in the showcase. He recalled seeing a man in the store around that same time and suspected that he may have lifted the item. After contacting police, it was discovered that the man had traveled to Rochester and a detective was sent to follow the suspect. When the detective observed the man attempting to sell the ring to several store owners, he was placed under arrest and later charged with 2nd Degree Grand Larceny. Although theft was rarely a problem for Daniels, a similar situation occurred in 1928 when William Robinson was arrested for selling a ring that his wife had stolen from the jewelry store two years earlier. On May 2, 1934, John and his wife Frances celebrated their 50th wedding anniversary and just one year later, Daniels sold his business to Charles Tibbits, his employee of 28 years. The couple retired to St. Petersburg, Florida where John Daniels passed away on January 27, 1942. The photograph reveals a number of beautiful silverware sets on display in the front window; through the front door, a wall clock is visible displaying the time, 10:35. As Daniels stands to the left, the three young men standing with him were probably employees, one of those men is likely Charles Tibbitts. Two pieces of advertisement are barely visible; the south wall facing East Bank Street included text about the store, the other piece included the large pocket watch mounted on the pole in front of the store which was an iconic signature of the business.